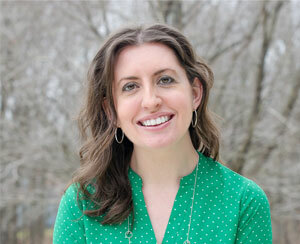 A few weeks ago, I participated in a blog swap with Lisa from Mabey She Made It. Yesterday both of our projects were featured at Lil' Mrs. Tori from a party Lisa linked up to....isn't that crazy? It is so exciting to be able to share my creation with a new audience, but I wanted to make sure that all of you saw what I painted, too! After a recent email request, I'm also including a little bonus here for you, my loyal readers.....keep reading to the bottom and see what it is! 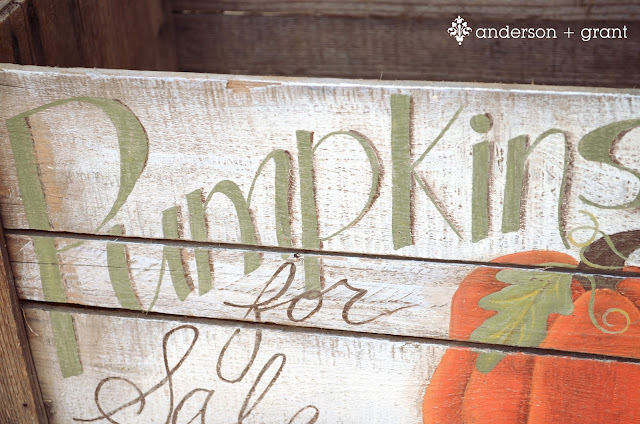 My project combines my loves of fall, painting, and vintage treasures. 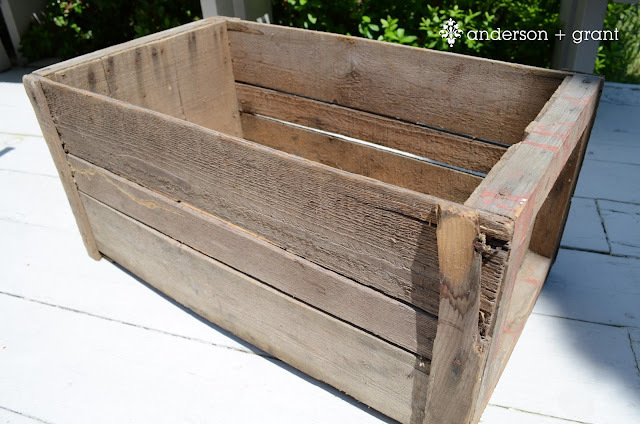 I purchased this crate at an estate sale (the same one as my green table) and I think the wood is perfectly aged and beautiful. Old items have so much character to them....rusty nails, broken boards. Love it! I was originally saving the crate to paint something for the Christmas season. 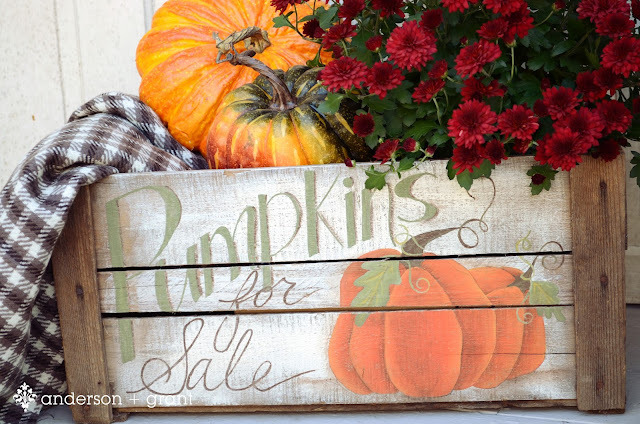 But I realized that the side of the crate reminded me of a wooden sign, so I decided to paint it like one for fall. I began by rubbing the edges of my board with a clear votive candle. The wax creates a resist and your paint will chip right off when it is sanded. 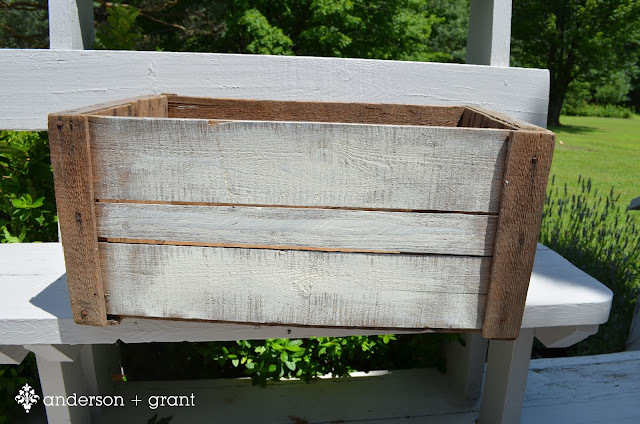 I followed the wax with one coat of antique white colored chalk paint that I mixed myself. I didn't try to cover the entire surface because I wanted it to be a little rustic and worn. The better you paint a surface, the more work you'll have to distress the piece! I taped paper together to form the size of my crate and then sketched out my plan. 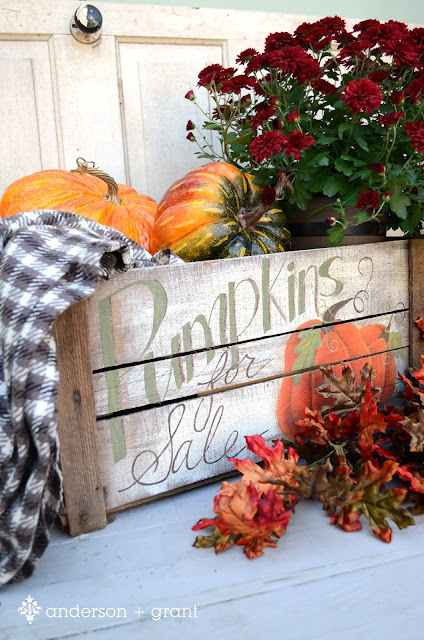 I wanted it to say "Pumpkins for Sale" and I also wanted a couple of pumpkins on the side. When painting a sign, you can print out your letters on the computer if you are uncomfortable sketching words out by hand. I laid carbon paper across the side of my crate, placed the pattern on top and used a pencil to trace over my lines. When I paint, I don't typically have the patience to do a lot of the floating and shading that is involved with decorative painting. Because of this, I basecoated my pumpkin in a burnt orange, then when it was dry, I coated it with another coat of burnt orange and shaded with a golden yellow and burnt umber while the paint was still wet. I like the blended look that can be achieved with this technique. I did the same thing with the leaves using shades of green and golden yellow. 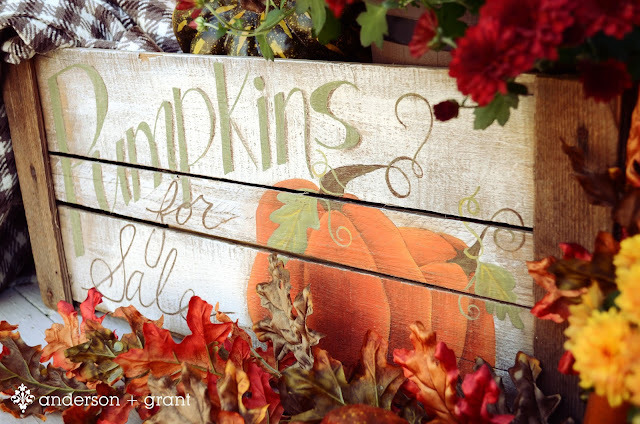 I also painted in the letters and then added a little dry brush shading around the pumpkins and letters with burnt umber. The added shading really makes your painting pop! When the paint was all dry, I gently rubbed over the piece with some fine grit sandpaper to wear away the edges and make the painting look worn. I sanded a little more on the shading around the letters to blend the paints together. I then sealed the entire painted area with some satin varnish to protect the finish. I'm thrilled with how this piece turned out and think it looks great filled with a wool blanket, some pumpkins and fresh mums. 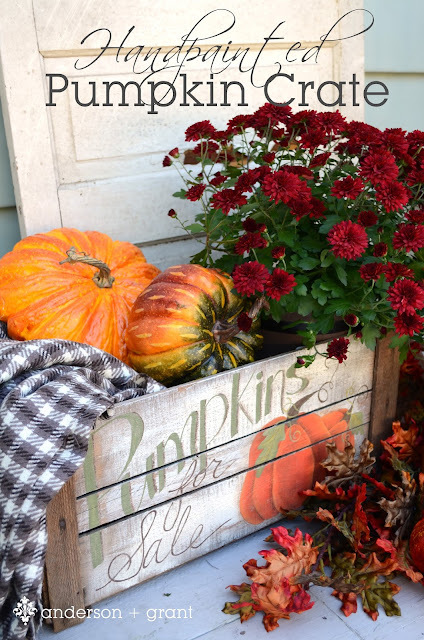 It can even be turned around and used to decorate during another season! 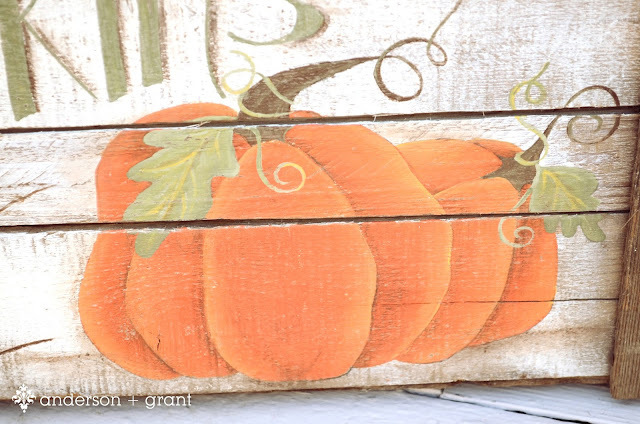 And now for your bonus...In case you wanted to paint this pumpkin sign idea for yourself, here is a pattern you can print off for your own personal use. (If you want to make this sign, feel free to use this graphic, but please do not sell the pattern in any form.) To use it, save the picture and then paste it into a Word document and adjust the size by pulling the corners of the picture. You can make the sign as large or as small as you want!